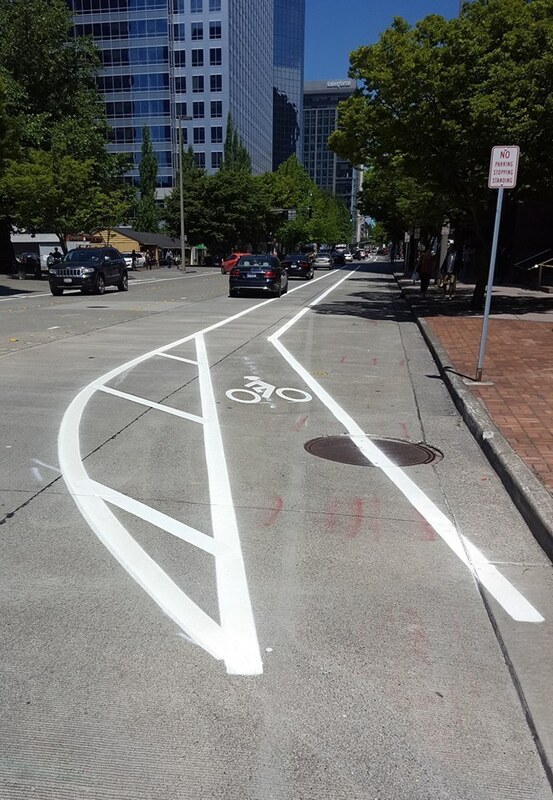 Whether or not you're an avid bike rider, you might have noticed some fresh paint on 108th Avenue NE. If you're wondering 'what's happening,' look no further! 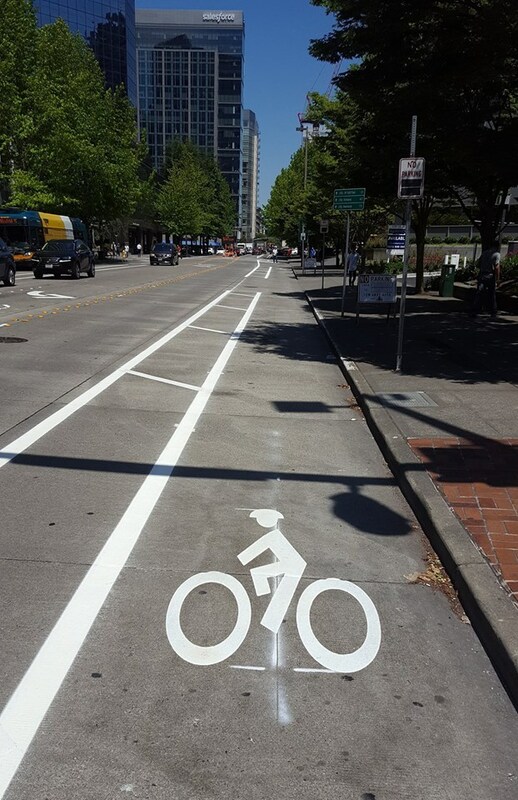 Starting June 10, the City of Bellevue began installation of a protected bike lane - the Demonstration Bikeway - along 108th Avenue NE. Read on if you're interested in learning more about this project, and how it will enhance livability and mobility in Downtown Bellevue. 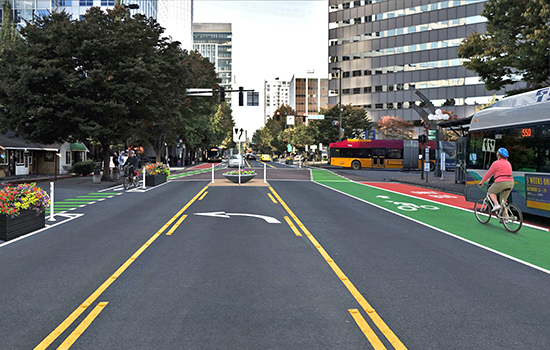 The Demonstration Bikeway is a City of Bellevue project that will add a protected bike lane through Downtown Bellevue along 108th Avenue NE from Main Street all the way to NE 12th Street. The bikeway will provide a safer and more comfortable route for people to bike north-south in the Downtown core. The City Council's vision of a network of well-connected bicycle facilities in Bellevue will enhance livability, support economic vitality, and serve the mobility of people of all ages and abilities. These investments are aimed to make Downtown a more attractive and accessible place for people to live, work and visit. Construction began June 10 and the project is expected to be finished in July. A celebration to mark the new bikeway is planned for Tuesday, July 31st, 11:30 a.m. - 1:30 p.m. at 600 108th Avenue NE. The separations, and barriers are temporary and low cost. The demonstration project provides a real-world opportunity to evaluate how the latest bikeway design concepts function in Bellevue. During the course of the project (approximately 1 year), data will be collected to evaluate how the project impacts travel for all street users, local businesses, and others in the community. If outcomes are favorable, City Council could approve more permanent upgrades in the future, including more robust bike lane separation, traffic signal modifications, durable pavement markings, and other changes to curbs and the streetscape. This demonstration project could help guide other Downtown bicycle improvements. Construction has already started and will continue through early July. Work hours are 7 p.m. - 4 a.m., Sunday through Thursday. Because the work is taking place during the evening hours, major construction impacts and/or traffic delays are not expected. The work is dependent on dry weather conditions.